For one of my projects I wanted to do some daily checks and send the results by email to me and some colleagues. Of course this can be done by creating a worker role, but there is another (easier) way, by using Windows Azure Mobile Services. 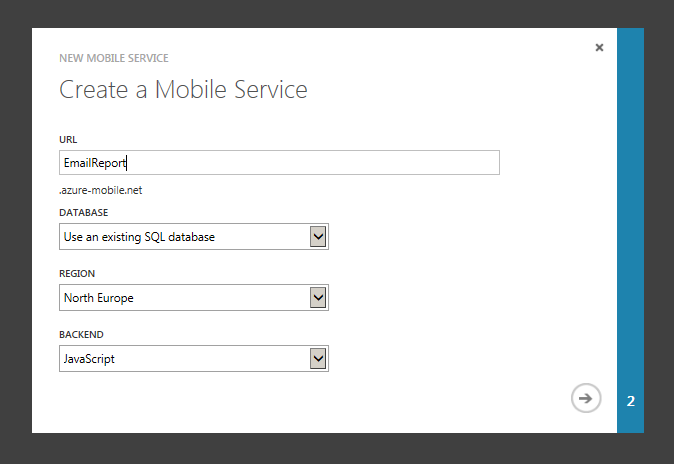 This way you don’t have to deploy anything, just create a stored procedure in SQL Azure and configure the Mobile Service. 1. 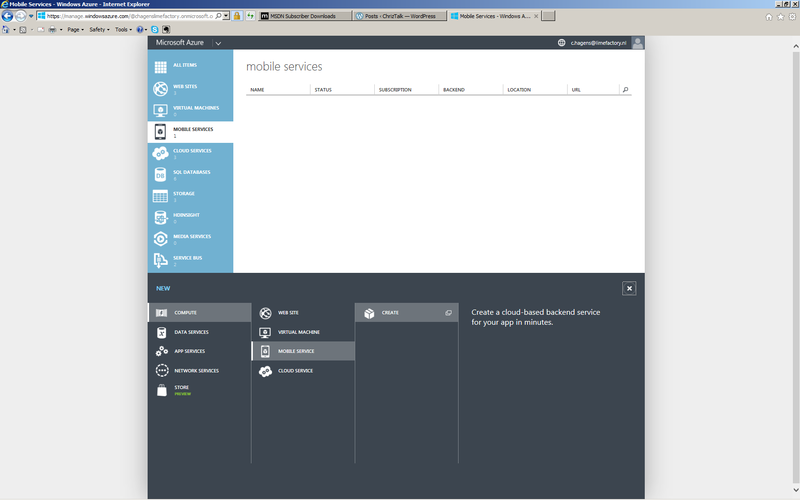 Create a mobile service from the Windows Azure management portal. Next you have to select the database and provide your credentials. You can ignore the warning about the region (sometimes the mobile service isn’t available in the same region as the database). 2. After creation completed (this can take up to a minute or more), select your newly created mobile service and go to the ‘Scheduler’ tab. 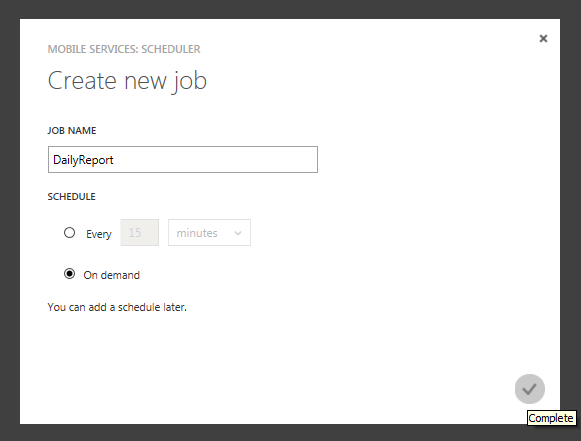 Create the schedule, name it and select ‘On demand’ (for testing purposes). 3. Select the newly created schedule and select the script tab. You can do this by creating a new item in the management portal and choose the store. Pick a plan, choose a name and region and finish your purchase. 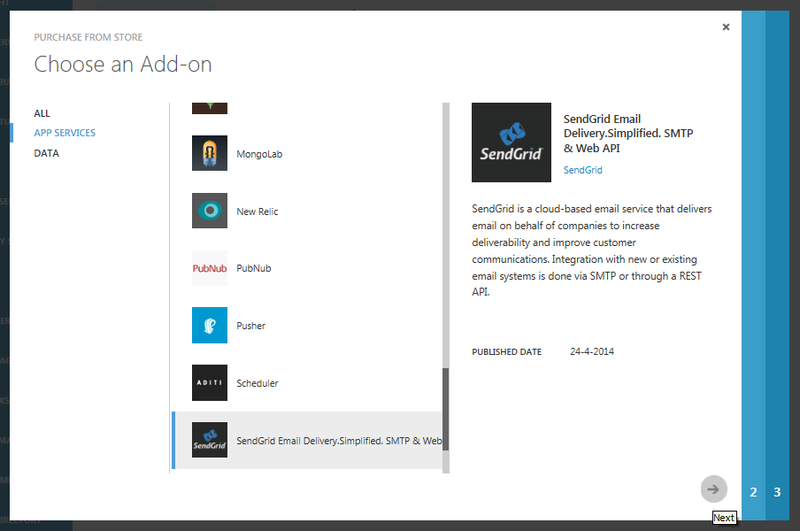 Now you should select the SendGrid app service from the Add-ons page. Select the Connection Info and write down the username and password. We will need this in the next step. 4. Go back to the schedule from your mobile service and select the ‘script’ tab again. Paste the following code in the script. 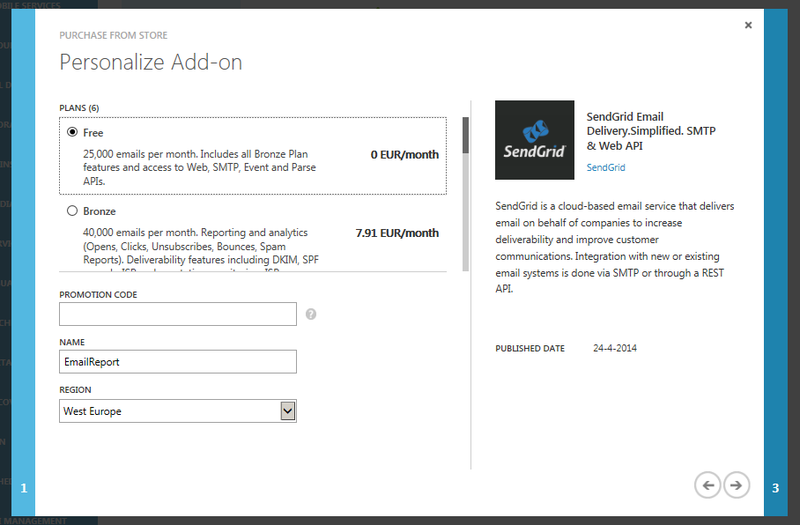 Fill in your SendGrid username and password (from step 3) on line 6 and modify the email addresses, subject etc. on line 8-10. 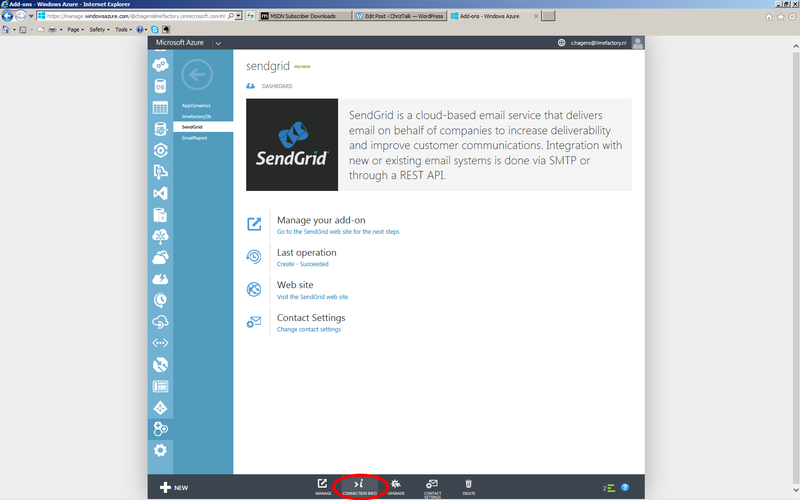 Check https://github.com/sendgrid/sendgrid-nodejs for more infromation about the SendGrid node.js module. 5. 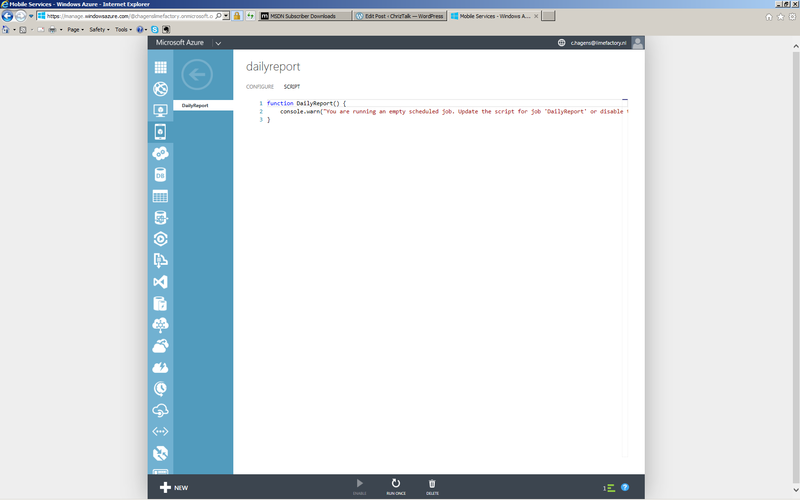 Last is creating the DailyReport stored procedure and setting the permissions. In this example I will create the email body in the stored procedure as html. 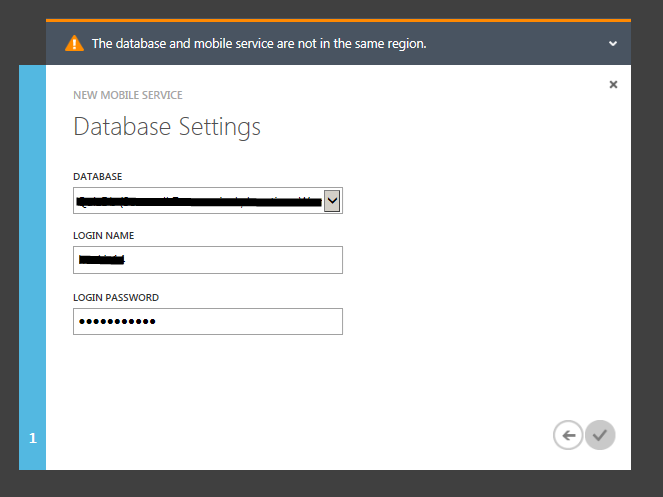 When your created the mobile service there was a login created in the database you selected. This is the user that will execute the stored procedure and you should give it execute permissions. So change *********LoginUser on line 13 to this user. 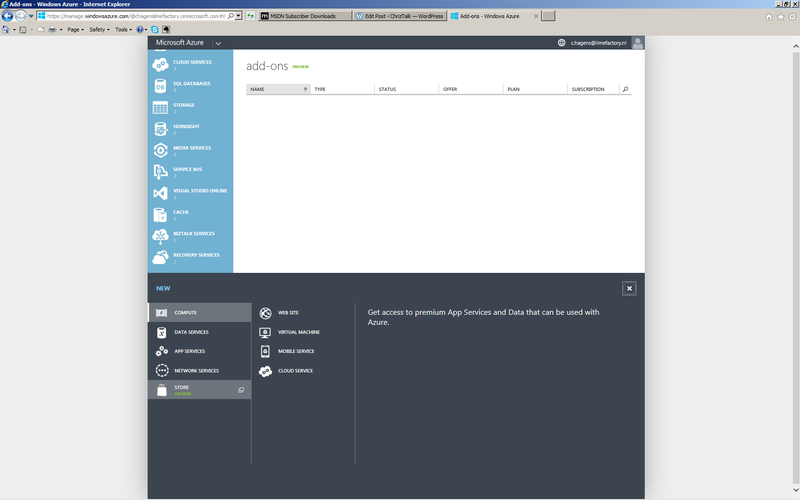 You can get the username by connecting to your SQL azure database from the SQL Server management studio, select the database, go to security and then to users. Now you should be ready to test it. Go to schedule again and press the run once button. When everything is working, you can define the schedule you want and enable the schedule. Hi there thank you for providing an example that works for someone with very poor java skills.. I have one request… could you extend this sample to include setting the to: from and subject parameters as variables … similar to how the MailBody content is selected from the store procedure in your example.